The harvest is abundant, the laborers are few, the Gospel of Matthew (9:37) tells us. But “few” is a relative term. Two hundred thirty-six catechists and directors of religious education from throughout the Archdiocese of Philadelphia who were marking significant anniversaries were honored at the annual Mass and award ceremony for Parish Religious Education Programs (PREP) at the Cathedral Basilica of SS. Peter and Paul on Jan. 14, with Archbishop Charles J. Chaput as the celebrant. 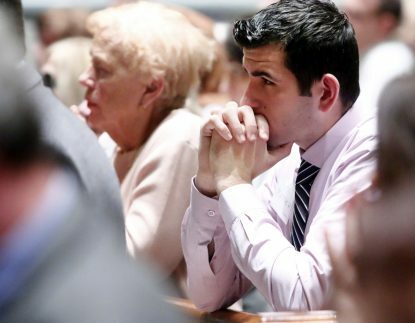 The truth is, it would be several times that number if all parishes chose to honor their laborers at the Mass. In his homily Archbishop Chaput nicely wove in the readings of the day into the occasion. In the Gospel, “Jesus is going about being a catechist, and teacher,” he said. “He is going along the seashore where he did much of his teachings, according to the Gospels. The crowd came to him and he taught them. The catechists and DREs receiving the awards were honored for various numbers of years of service. Marge Jarmin of Epiphany of Our Lord Parish in South Philadelphia had the most seniority; she received the St.
Marge Jarman, from Epiphany of Our Lord Parish in Philadelphia, receives the St. Augustine Award for 50 years of service. 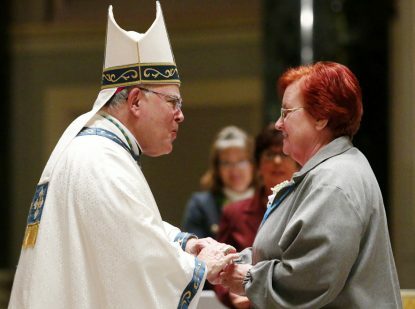 Augustine Award for a remarkable 50 years as a catechist. “When I was 13 Sister Veronica at my school asked me if I was interested in helping to teach her class,” she recalls. “I went with her and I was hooked from then on. I started at Stella Maris for a couple of years but it was Epiphany from then on. Epiphany has about 160 kids in the PREP program including 36 in the confirmation class taught by Jarmin. Donna Heeney, the DRE at St. Robert Bellarmine Parish in Warrington, was there to accept an award for 20 years of service while four of her catechists were also honored. On hand too was Msgr. James Beisel, pastor of St. Robert’s, to see his parishioners honored. 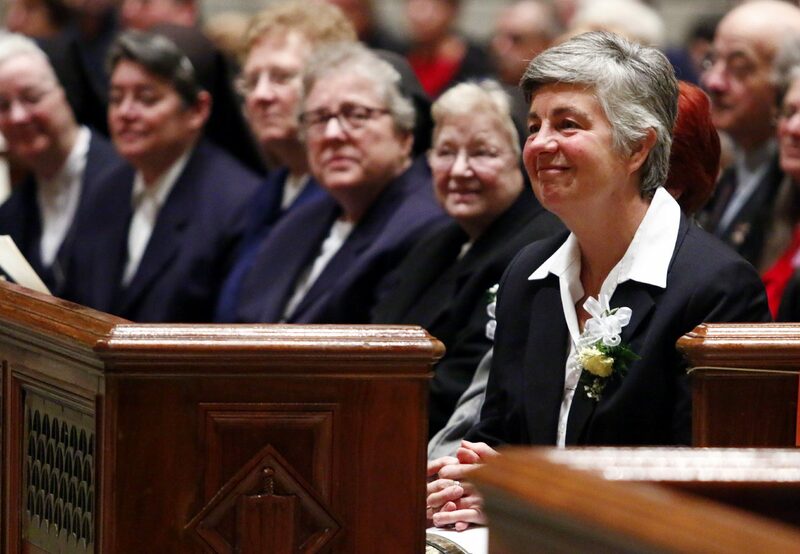 Most of those honored were women, as Archbishop Chaput observed in his homily. However there were some men. Joe McQuillin was honored for five years teaching at Sacred Heart Parish in Hilltown, and he brought four of his grandkids along as cheering section. “I have the sixth grade, and I’m attempting to teach them about the Old Testament. It’s enjoyable,” he said. Several pews on the right side up front at the cathedral were reserved for the hearing impaired. Those pews were well-filled, out of support for the awardee of the most prestigious award and the last presented, the Pope Paul VI Award for Catechetical Leadership. That was given to Immaculate Heart Sister Kathleen Schipani, who has a national reputation for her work in the deaf community. 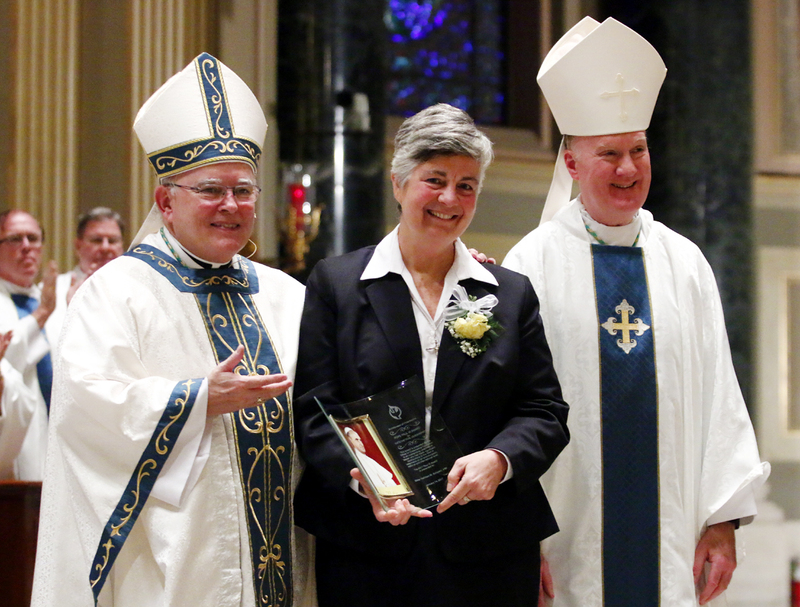 Not to be outdone, Philadelphia’s St. William Parish presented her an award of their own. It was the first parish where she served in the city, and they can say they knew her when. God bless all Catechists and thank you for doing God’s most important work, passing on our faith to the young! Congratulations to our DRE at St Pius X Broomall, Mrs. Maryann Corcoran for being recognized for 30 years of service and Mrs. Carol Paris, SPX evening catechist confirmation teacher , 6th grade on being recognized for 40 years of service. God bless you both and thank you! walkbyfaithtolive.com.